On May 31st 2014, the Bloomfield Rotary Club furthered Foodshare's cause to end hunger and alleviate poverty in greater Hartford by holding a 50/50 raffle to raise funds for Foodshare. Half of the proceeds for the raffle were awarded to the winner, Danielle Fernino of West Hartford, on May 31st, 2014 and the other half went to Foodshare. 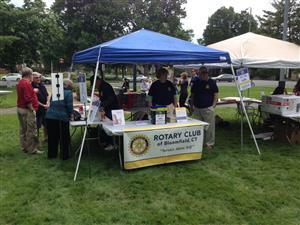 Rotary volunteers manned a booth and circulated the event selling raffle tickets to benefit Foodshare's great cause. Through their efforts, a check will be presented to Foodshare in the amount of $333.00. The Bloomfield Rotary Club is a regular supporter of Bloomfield-based Foodshare through monetary donations of thousands of dollars and volunteerism. This is yet another example of how the Bloomfield Rotary is supportive of efforts to make the global and local communities a better place to live and work.